This morning I am writing to you on my parents closed in porch where three tiny kittens and their mother are currently living. The little cats are running around behind boxes and under the bench and around the futon and generally being very adorable. This is my kitten fix for the week. I spent my whole life with cats right outside my door. I grew up on a farm of sorts where cats were plentiful and very friendly. Right now there’s a tiny cat trying to climb all over my key board. My first cat was named Velcro and she was a sweet orange cat whom we named because she latched onto things with her claws, just like Velcro. 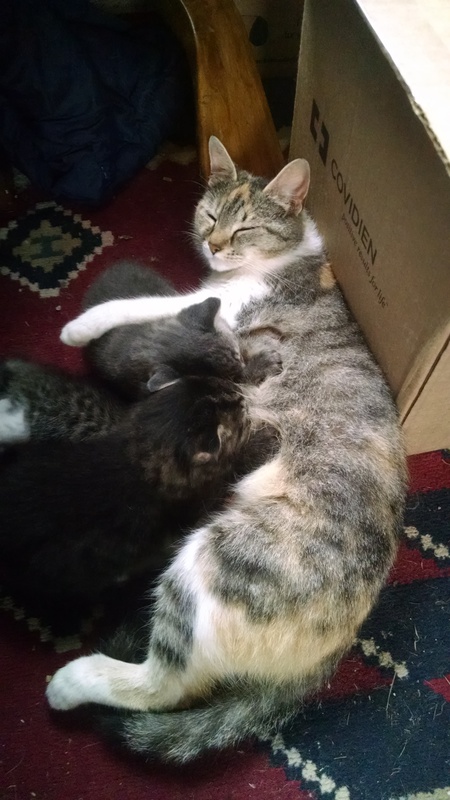 We had her for a very long time and she was the mother of many, many kittens. Every spring and fall at least one of our cats, if not two or three, would have a littler of kittens. In the old days there could be as many as six in a littler, providing us with a whole army of tiny cats to coddle until they were so attached to us that they would follow us around the yard. There were never less than four cats at our house at a time, though we would give away as many kittens as we possibly could and the boys would often wander off when they got older. Their numbers were always replenishing, sometimes getting up as high as 16-20 at a time. Seems crazy, huh? Well, we are a crazy cat family. With all those tiny cats running around, you’d think we’d run out of names for them all after a while. That is, however, the beauty of having three small children to name all of your cats. You get lots of creative an new names every litter. My brother and I would often pick characters from our favorite books to name cats after. Other times we would pick a theme for the litter. One year we had two orange cats which we named Pumpkin and Pie. Pumpkin was mine and my sister got Pie. It wasn’t until we got older that we started to run dry on names. I blame a dwindling imagination. I never thought I would be without a cat. When I grew up I always assumed I’d take some with me; my family had plenty. 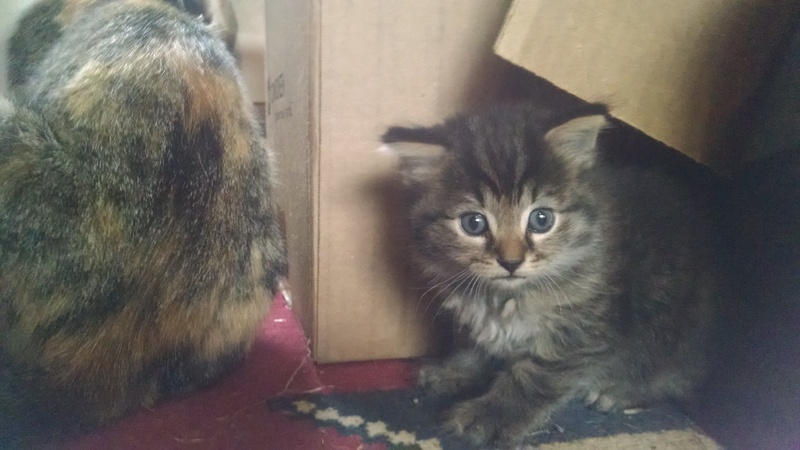 I’d just steal a kitten as I was moving away, if that ever happened. And then I went to college. No cats at college, but still, it was only one year of living on campus and I was only fifteen minutes away. I could get my cat fix any weekend I wanted. My husband and I always agreed when we got married we needed cats. He grew up with cats too, though in a much more reasonable quantity. We agreed that two cats would be sufficient for us, so they could keep each other company when we weren’t home. Unfortunately, when you need an apartment in two months and only one place gets back to you, you tend to go with that one place. We got a beautiful apartment, but no pets allowed. I didn’t realize how much I would miss cats until they weren’t allowed. So every week my husband and I get our cat fix from his parent’s two cats and my parents hoard of cats, when we can get up here and cuddle them, and every other week I hang out with our DM’s cat under the table at D&D. Next year we hope to rent a house where we can have cats, but until then we will have to continue to get our cat fix where we can and dream of our future kitties, who are at the top of our “when we have a house” list.